3. What Else Do You Need To Know About Bath Bombs? 4. What are Bath Bombs? 5. What do Bath Bombs Do? 6. What are the Benefits of Bath Bombs? 7. What are the Best Essential Oils for Bath Bombs? 8. How to Use A Bath Bomb? 9.1. Do Bath Bombs Expire? 9.2. What is the best way to store bath bombs? 9.3. How many times can you use a Bath Bomb? 9.4. Where to buy Bath Bombs? 9.5. Are Bath Bombs safe for kids? 9.6. Do you need to shampoo your hair when using a bath bomb? 9.7. Are bath bombs safe for pregnant women? 10. Time for A Short Quiz! Bath bombs that can help turn any regular time in the tub into a glamorous soak have become all the rage these past years. People just can’t get enough of those colorful and fizzy balls. Today, there are so many bath bombs to choose from that you may find it a bit confusing to find the best one for your next soak. This is why we created this short buying guide that can help you find the Best Bath Bombs you can get for less than $25 bucks. Below you will learn all about the best-rated bath bombs, how to spot them, which one is the best, and how to use them the right way. Are you ready to find the right bath bomb for your next soak? Just scroll down and let’s get started! Before we move on to our short reviews, here’s a clear table that contains a couple of necessary information about the products we included in this roundup. Try to observe the data we gathered in this table. By reading this table, you will be able to determine which one you like best based on the combination of features it possesses. Think about your personal needs and preferences to examine which one of these products best fit what you are looking for. Don’t forget to look out for the quantity too. It’s a key factor to knowing if you’ll get your money’s worth. Can’t wait to get home and take a relaxing soak in your tub? With this Life Around 2 Angels bath bomb set at your disposal, you may not even be able to wait any longer to go home and take that soak. What’s great about this set is it came from the company that makes some of the best bath bombs in the market today. What we like about this bath bomb set is that it offers a dozen different options for you to choose from. It includes various scents like Angel, Black Raspberry Vanilla, Fun in the Shower, Fun on the Beach, Kiwi & Strawberry, Lavender, Lemongrass Green Tea, Love, Mango Papaya, Melon Ball, Shea & Coconut, and Victorian Rose. It also has these cute flower petals and a mix of therapeutic and moisturizing ingredients that are quite similar to what the best lush bath bombs have. If you are looking for the kind of bath bomb that would take the stress off from a long and tiring day, this is the bath bomb you should get. With so many bath bombs available in the market today, bath bomb makers are continuously trying to make their bath bombs more different than others. This Sky Organics bath bombs for kids packs in a fun surprise inside, a toy! Yes, this bath bomb exposes a cute little toy once it completely dissolves. Not only does this bath bomb come with a toy, but it also comes with organic essential oils and coconut oil that can make you get that smooth feel once you get out of your tub. Another exciting thing that can make this one of the best bath bombs is that it comes with bath sprinkles that you may or may not love depending on your tolerance for these things. Nonetheless, it is one of the most fun bath bombs you will be able to buy from the market today. 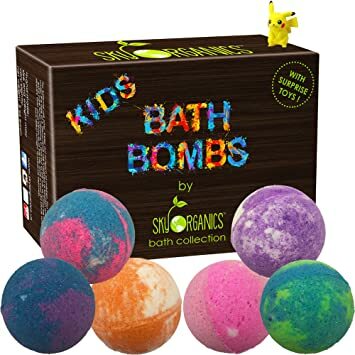 Whether you are getting this for a child or for someone who’s just a kid at heart, this bath bomb is undoubtedly built to entertain. What most people look for in bath bombs is size. If you are looking to get a massive bath bomb that can fill your tub with color and fizz, we urge you to check out this bath bomb set from Anjou. This bath bomb set is made with plenty of essential oils that will make you feel as if you are in a spa as you soak your body in your tub. What we like about this bath bomb is that it is 90% bigger than most bath bombs today, making it ideal for large tubs or soaking with some company. Another great property of this bath bomb is that it can help moisturize your skin. It’s also made with entirely organic ingredients including citronella essential oils, lavender, rose, lemon, sweet orange, and peppermint. 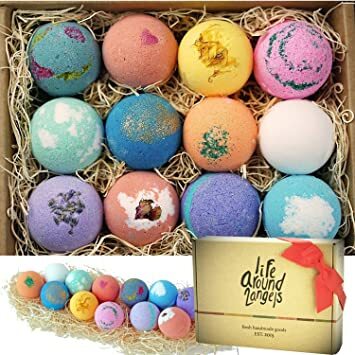 If you’re looking to get a bath bomb that’s more than just scent and color, do try and take a look at Art Naturals’ bath bombs. What’s great about these bath bombs is that it does so much more than add color and fragrance to your bath. 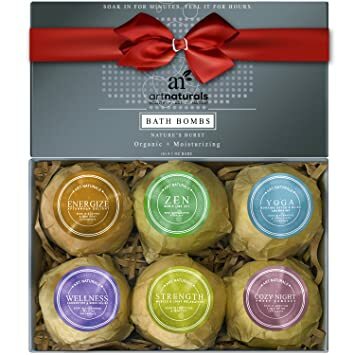 These bath bombs from Art Naturals come with moisturizing ingredients, antioxidants, and soothing muscle properties. With only a single soak in your tub with any of these bath bombs, you will be able to come out of your bathroom smelling fresh, entirely clean, and relaxed. What made us put this product on our list of the best bath bombs is its capability to help your body’s muscles relax. It even comes with therapeutic scents that can help relieve anxieties and stress. Looking for the best gift for a friend? Check out these wrapped bath bombs that come complete with a label and ribbon, entirely ready to be given as a gift. These largely sized bath bombs are the best bath bombs for gift giving since it costs less than $25 bucks and you already get ten bath bombs that you can provide to ten different people. Each bath bomb in this set is roughly the size of a large tennis ball and are made of high-quality natural ingredients. It also comes with flower petals, buds, glitter, and sea salt. 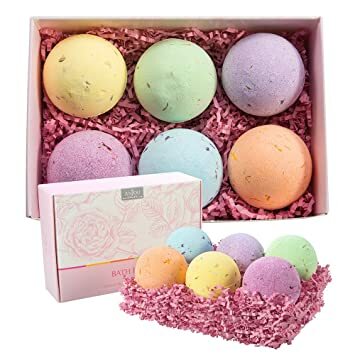 Whether you are looking to get a beautiful present for your friends or a nice set of bath bombs for yourself, this collection will undoubtedly give you the best value for your money. What Else Do You Need To Know About Bath Bombs? To help those of you who haven’t had any experience buying a bath bomb before, here are a couple of things that you may find useful to know before you buy and once you get your bath bombs. So what exactly are bath bombs? What are they for? And what are they made of? There are so many things that you can learn about bath bombs. But before we go into the details, let us first tell you the basics. Bath bombs are something that you can add to your bath water in the tub to get a more colorful, fragrant, and relaxing bath. Bath bombs usually come in sphere shapes but can still come in other forms since it’s practically just a compressed set of ingredients. Bath bombs can contain an assortment of ingredients including baking soda, citric acid, fragrance oils, essential oils, antioxidants, flower petals, sprinkles, glitters, toys, and coloring . Some of the best bath bombs today offer the perfect combination of colors, scents, and effects. What do Bath Bombs Do? If you’ve seen a bath bomb in action, you’ve apparently noticed the way the whole thing fizzled and dissolved in your tub. You may have also noticed the swirls and ingredients that have suddenly come afloat in your bathtub. How does this happen? What exactly are the best bath bombs doing the moment they touch the water in your tub? To understand what bath bombs do, you must first know the basic science that takes place behind it. You see, bath bombs come with sodium bicarbonate and citric acid. These two elements start reacting to each other once the bath bomb hits the water, therefore producing the fizzy bubbles in your tub. As the bath bomb starts to fizz and dissolve, it then lets out all the oils, fragrances, detergents, petals, and colors onto your bath water . What are the Benefits of Bath Bombs? Plenty of people think that even the best bath bombs are just these balls that dissolve and add color to your bath water. Don’t get fooled into thinking that too. Bath bombs can offer so much more than a prettier bath. When it comes to aesthetics, bath bombs can decorate your bath with all sorts of things from petals, sprinkles, glitters, and even toys. But bath bombs today has gone far beyond pure aesthetics, bath bombs today are also equipped with muscle soothing properties and hair cleansing ingredients. Bath bombs can also help moisturize and smoothen your skin, especially if it has essential oils and antioxidants. Epsom salt-infused bath bombs, on the other hand, can offer you the benefit of wholly relaxed muscles. Another great benefit of a bath bomb is it can help set the mood quick. Whether you are trying to brighten up bath time for the kids or making the setting feel a little more romantic, bath bombs can undoubtedly help you get the job done. What are the Best Essential Oils for Bath Bombs? You can find bath bombs made with all sorts of essential oils these days, which is why seeing the kind of bath bomb you prefer can be quite easy. All that you need to know now is which essential oils are the best for bath bombs. The most common essential oils used on bath bombs are Lavender, Rosemary, Peppermint, Ravintsara, Lemon, Grapefruit, Ylang Ylang, Petitgrain, Vanilla, and Chamomile Roman. The best kind of essential oil for you would, of course, depend on your personal preferences and needs. If you have no idea about the effects of essential oils, try out these combinations for size. To achieve a balanced mood, try mixing up bath bombs with Lavender, Ravintsara, Peppermint, Chamomile, Vanilla, and Ylang essential oils. For an energizing soak, you could mix up bath bombs with Rosemary, Peppermint, Ravintsara, Eucalyptus, and Tea Tree essential oils. If you need to clear your mind, the best kind of bath bomb combination for you would be a mix of those with Rosemary, Lemon, Ravintsara, Grapefruit, Needle oils, and Cineol Oils. If you are aiming for relaxation on the other hand, we suggest using bath bombs with Lavender, Ylang Ylang, Vanilla, Chamomile, or Petitgrain essential oils. Need a pick me up? Try to soak yourself in a bath with bath bombs equipped with Grapefruit, Petitgrain, Peppermint, Ravintsara, or Lemon essential oils for an uplifting mood. Lastly, if you feel very stressed, you can also use bath bombs with Lavender, Vanilla, Ylang Ylang, Petitgrain, or Chamomile essential oils to calm down your mind. Now that you know more about bath bombs let us now dive into how to properly use a bath bomb. If you ask us, there aren’t any rules to using a bath bomb. It can be as simple as throwing the whole thing in your tub and waiting for it to fizz and dissolve. However, there are a couple of things that you may want to try to enhance your bath bomb experience. Some bath bombs can come with sprinkles, flower petals, flower buds, and all sorts of things that can be a bit of a pain to wash off your tub or can clog your tub. To avoid the distressing clogged tub and strenuous tub cleaning, what you can do is wrap your bath bomb with fabric. Doing so will ultimately prevent the other ingredients to float away and disperse in your tub. The fabric will not prevent any of the color or essential oils from getting into your tub water so no worries about not getting what you paid for. Bath bombs aren’t the cheapest sanitary products in the market since you only get to use them one time. With this in mind, you may want to be thrifty with your bath bombs by cutting them in half and saving some for later. If you like, you can cut bath bombs in half with a sharp serrated knife. To keep the other half fresh for later, you can try wrapping it in a piece of fabric. You may even try mixing and matching bath bomb halves. If you’re into mixing fragrances, you may want to cut your bath bombs in halves or quarters. You can try to form a whole bath bomb with the combination you prefer. Bath bombs differ in shapes and sizes, which is why some bath bombs may come with different water level requirements. To get the best out of your bath bomb, make sure that you follow the instructions that come with it. When in doubt, just at half a bath bomb to your water and continue to add more until you are satisfied with the color and fragrance. A lot of people ask when is the right time to enter the tub when using a bath bomb. There is no wrong time to come in the bathtub, you can simply enter anytime you are ready. You can either wait for the bath bomb to dissolve entirely or you can watch it fizz in front of you as you sit in your tub. The effect of the bath bomb will not be affected by your presence on the tub. You can also leave the tub anytime you please. You don’t even have to rinse it off unless it has glitters and other things that you don’t want on your body . To help you gain a firmer grasp on bath bombs, here are a couple of answers to some of the most frequently asked questions by people looking to buy and use bath bombs. It would be normal to think that bath bombs come with an expiration date just like most hygiene products do. But on the contrary, bath bombs don’t have a specific expiration date. Bath bombs naturally lose effect as time goes by. Sure you can still use them, but don’t expect them to provide you with a colorful and fragrant bath. You may not even get that bubbly fizz that bath bombs are known for. The best time to use bath bombs would be no more than one month from the day you purchased it. Any longer than that and you will have a bath bomb that has significantly degraded effects. What is the best way to store bath bombs? If you’re a bulk shopper who’s crazy about bath bombs, you will want to know about the best way to keep them so that you’d still be able to get the best bath bomb experience even when they’re no longer fresh from the store. The best place to keep bath bombs is no other than the bathroom. Try to keep your bath bombs inside an airtight container. It is essential for your bath bombs to stay dry, which is why you should take extra precautions like using plastic wrap to double seal containers to achieve an airtight fit. Tip: If you have some of that silica gel packets lying around your home, you can place that inside your bath bomb container to completely prevent moisture build up. Do Lush bath bombs stain your tub? If so, what’s the best way to do it? Yes, even the best bath bombs can be a bit of a hassle to use since they can still stain tubs. There are two things that you can try to efficiently clean your tub after using a bath bomb. The first thing is a simple rinse. Sometimes mere water can get rid of the color stains in a tub. The second thing you can try is applying soap or detergent to the stains. Give your tub a gentle rub with a soft sponge, and you’ll have it good as new once rinsed thoroughly. How many times can you use a Bath Bomb? Plenty of bath bomb lovers ask how many times they can use a bath bomb. Some people say they use it once a week, others at least thrice a week, while some used it as they please. The thing is, there’s no harm done in using bath bombs regularly. Since bath bombs mostly contain essential oils, colors, and other skin enhancing products, they do not pose a severe threat to your health. However, if you happen to have allergic reactions to bath bombs, then the best answer to this question may be not to use bath bombs at all. Where to buy Bath Bombs? You can buy bath bombs pretty much anywhere these days. You can buy them in malls, drugstores, and online. If you don’t know where you should buy your bath bomb, we suggest trying to purchase over the internet instead. Sure being able to talk to a salesperson may make it easier for you to know which product you should get, but when it comes to getting the best value for your money, nothing beats ordering stuff from the internet. Most products can be bought from the internet at a lower price. What’s more is that you don’t need to gas up and go to the store, you can just wait for it to get delivered to your doorstep. If you’re worried about product information, you can rest easy knowing that most online stores come with product reviews from other customers, which means you are getting actual customer insights about the product. Furthermore, some bath bomb brands can be a bit difficult to spot in stores. The best chance for you to get the exact bath bomb that you want is by buying it online. Not all kinds of bath bombs are safe for children. And all bath bombs are not safe for children who are less than three years old. Never use a bath bomb on a child especially if it doesn’t say anywhere on the label that it is kid-safe. Bath bombs can easily cause children to get allergic reactions and skin issues since their skin is a lot more sensitive than the adult skin that plenty of bath bombs are made for. When using bath bombs for kids, always keep an eye on the children. You wouldn’t want the kids to accidentally drink the bath water. Do you need to shampoo your hair when using a bath bomb? The answer to this question would depend on the type of bath bomb you are using. If the bath bomb you are using comes with detergents or hair cleaning ingredients, then we guess it’s safe to say that you no longer need to shampoo your hair when using that bath bomb. Otherwise, it’s still suggested that you shampoo your hair if you wish to rid it of excess oils and dirt. Are bath bombs safe for pregnant women? Being pregnant can cause to avoid a lot of things that can be bad for the baby. It’s a good thing bath bombs aren’t one of them. Pregnant women can use bath bombs as they please. In fact, there are even some kinds of bath bombs made for pregnant women. Some bath bombs are used for stretch marks and skin dryness caused by pregnancy. However, pregnant women may still want to check with their doctors first to ensure their child’s overall safety. Time for A Short Quiz! We hope you learned a lot from our short reviews of the best bath bombs today. Before we end this article, allow us to tease your brain with this short quiz. Don’t worry, the questions are so easy. It may even help you decide which kind of bath bomb you’d like to get. After doing extensive research and testing to identify which of the five best bath bombs above is the best bath bomb of all, we finally came to a sound decision. Careful deliberation of every product in this buying guide lead us to conclude that the best bath bomb is Life Around 2 Angels Bath Bombs. What made us choose this bath bomb as the winner in this roundup is the excellent mix of ingredients that allow it to be therapeutic and easy to use at the same time. It is definitely the kind of bath bomb that you’d enjoy using every time. 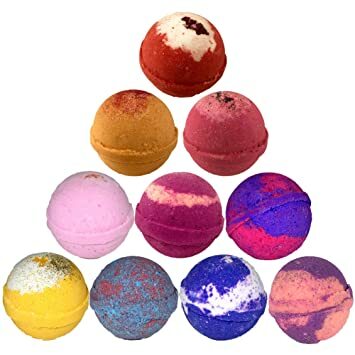 Furthermore, this bath bomb set includes 12 different pieces that can offer you 12 different scents. Considering its price, it’s the best bath bomb that you can get under $25 bucks. Well, there you go! A short buying guide that can help you find the best bath bombs under $25 bucks. Watch out for our other articles if you want to know about more beauty tips. Don’t forget to show your support and share this article with your friends! I ADORE bath bombs. I’m so excited to try some new ones. Also, everything under $25?! It doesn’t get much better than that. Thanks for the informative article!